Recently, California’s Indian community rejoiced in the achievement of a 16-year-old Indian girl from Fullerton. When Henna Sanghvi wore the crown of Miss Fullerton Teen USA 2018 at the Hilton Irvine, Indians in California went gaga over the ‘crowning’ moment and blessed the Desi girl. In 2016, New Jersey Indians were honored when Chhavi Verg bagged the ‘Miss New Jersey USA 2017’ title. Miss Fullerton Teen USA 2018, Henna Sanghvi studies at Canyon High School in California. She is the face of Fullerton for the Miss California Teen USA Pageant, which will be held in December 2017. The ‘Miss California Teen USA 2018’ title winner will compete for the crown of Miss Teen USA 2018. The Desi girl from Fullerton Indian community, Henna Sanghvi dreams of an illustrious career in the online fashion retail space. She hopes to learn the business of fashion retailing in the virtual marketplace. Being diligent, she had been training hard for months for the Miss Fullerton Teen USA 2018 pageant. She trained under Giselle Boone, a renowned modeling scout and runway coach. Henna Sanghvi is a dance and music enthusiast. She is an accomplished Bollywood dancer and guitarist. She is a social service aspirant too. She will be educating young people about the pros and cons of cyber world alongside preparation for the Miss California Teen USA 2018 Pageant. She will also be working to spread AIDS awareness in Fullerton. Currently, she helps to raise fund for children suffering from cleft lips in developing countries including India. 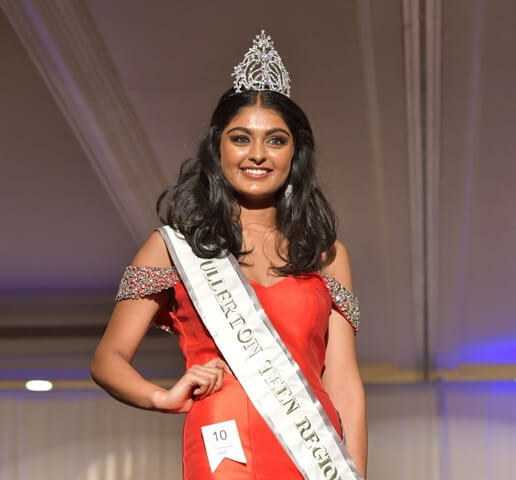 Miss Fullerton Teen USA 2018, Henna Sanghvi has bagged several awards including ‘Top of Tribe’ from her school, the California Scholarship Federation Award, the National Honors Society Award, and the Presidential Fitness Award. She is a trained volleyball player too. Evidently, Henna treasures the Most Spirited Volleyball Player Award and Scholar Athlete Award. We will be waiting to see Henna Sanghvi in the Miss California Teen USA Pageant at the Long Beach Convention Center in December. Now she is a pride of Fullerton, home of California State University. Travel Beats is a community magazine for Indian Americans by Indian Eagle. Travel Beats publishes the latest news and stories of Indians in USA apart from sharing air travel updates.